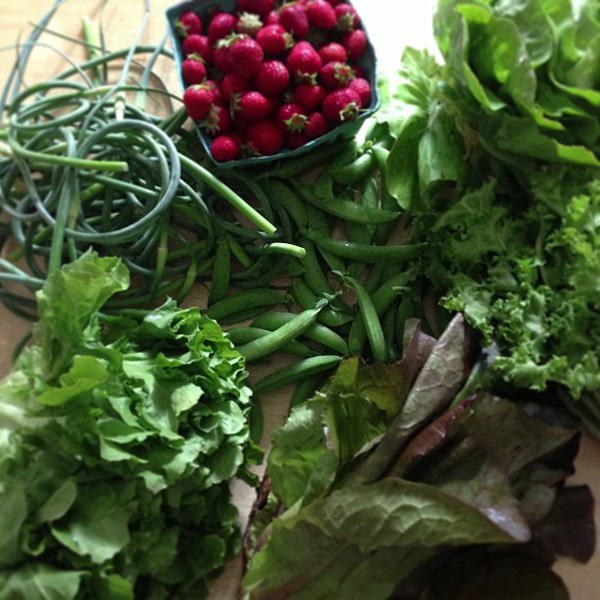 We got our second share of veggies from the CSA and there is a boatload of lettuce. I'm getting out the salad spinner and just leaving it on the counter for awhile. I have plans for the strawberries and promised the garlic scapes to my mom. 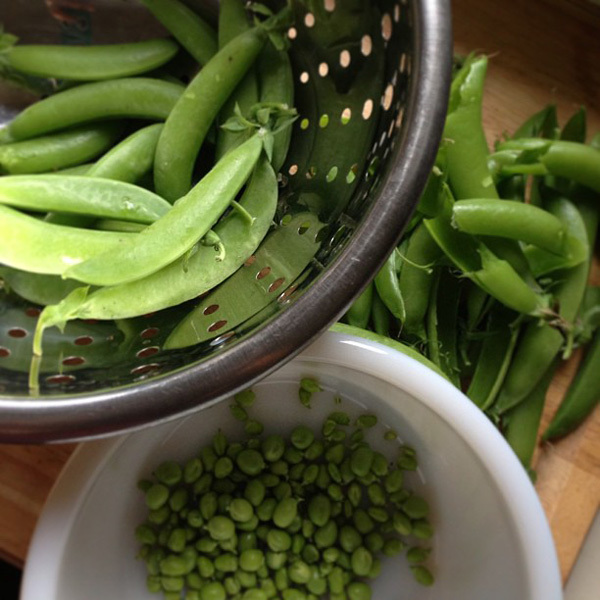 Aside from that, there were peas. So many possibilities. I settled on making risotto. I've never made risotto before! I love it... if it is on a restaurant menu chances are I will order it. But I never made it before, thinking it was too hard. The peas pushed me toward it. I used a combination of Giada's two recipes Red Wine Risotto with Peas and Mushroom Risotto with Peas. I liked the pea and mushroom combo but it made a lot more than the red wine version. I used the ingredient amounts from the red wine recipe but cooked it like the mushroom recipe. Oh, and I added bacon. I figured that would cover any mistakes I made. It wasn't as hard as I thought. Now, note that you can't leave the kitchen when you are making this. It does require your attention but it is pretty straightforward. The risotto turned out delicious and it will definitely become a repeat recipe! Those peas look so tasty! I wanted to share this recipe from Martha for a basic oven-baked risotto. It turns out nearly identical to stove top versions, and no stirring! I too make oven baked risotto because I'm too lazy to do the stove top version. It's still super yummy! You've inspired to put risotto on my meal plan this week. 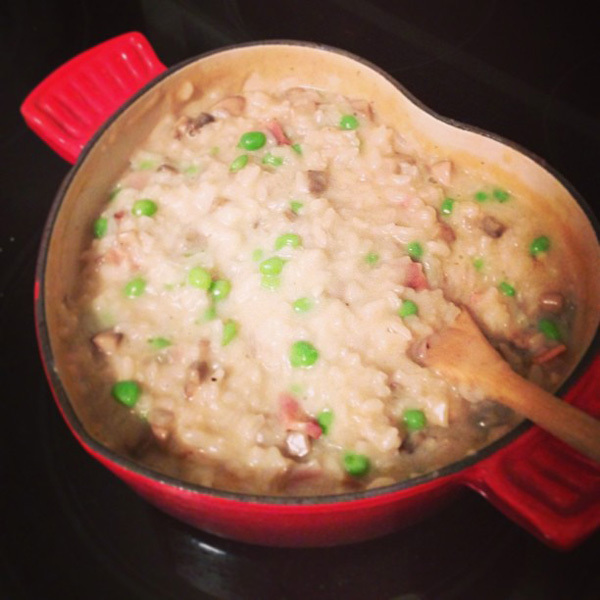 Risotto is one of our favorite things to make, and, we also use Giada's Mushroom and Pea recipe. We typically add chicken to it to make it a bit heartier for the kids. You slice chicken breast very thin, and brown it at the beginning stages and then remove it while the rice is cooking. Toward the end, add it back to finish cooking. Alton Browns's method doesn't involve all that stirring. You should check it out. Ooooh this oven baked risotto sounds promising! Thanks everyone! Chicken sounds good too... or maybe shrimp!